Excel is easily one of the most relevant and useful skills in the workplace but how much do you REALLY know? Do you list yourself as Excel-proficient on your resume/LinkedIn but you’ve honestly only used it to make tables? Live up to your claim by attending AccSoc’s 2 hour workshop, where you’ll have the opportunity to learn how to use some of Excel’s most essential formulas and functions. 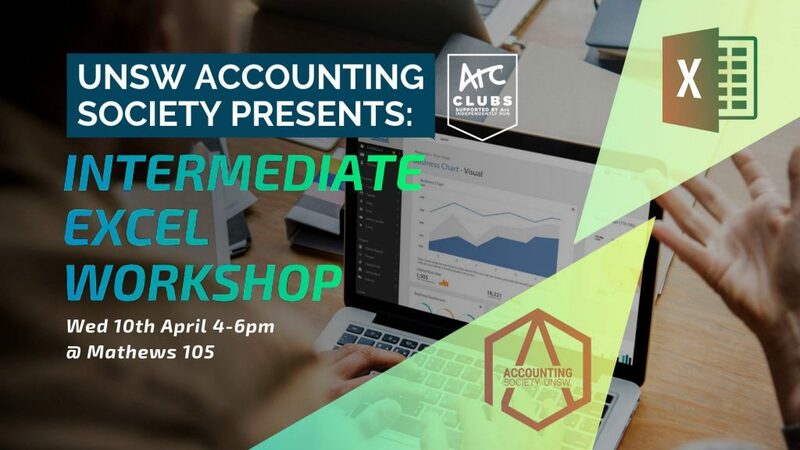 The workshop will be run by AccSoc’s experienced team of Directors and Executives, who have EXCEL-LENT knowledge and can vouch for Excel’s functionality in the workplace! We’ve also invited guest speaker Rob from UNSW Business School, who will be sharing how to go that one step further and receive Excel Certification on your resume/CV! No matter what industry you work in, it’s highly likely you’ll be surrounded by data and information, which is where Excel will come into play! Why not prepare yourself for the workplace by developing a strong foundation today? Other: Bring a laptop, we recommend you bring a Windows device but Macs will also be catered to! Check out our Facebook event to stay updated! ← UNSW AccSoc Presents: AccSoc Hoodies!